Also known as St Catherine of Alexandria. Her best known attribute is the wheel on which it was intended she would be killed. Divine intervention caused the wheel to collapse. 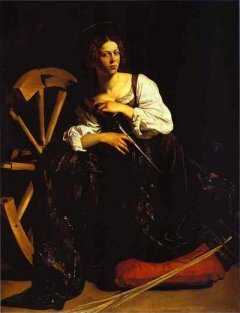 Catherine was one of a number of 'virgin-martyrs', legendary women who were prepared to suffer torture and death rather than surrender their virginity or compromise their Christian faith. Of noble birth and learned in the sciences, when only eighteen years old, Catherine presented herself to the Emperor Maxentius. She endeavoured to prove how iniquitous was the worship of false gods. Astounded at the young girl's audacity, but incompetent to vie with her in point of learning the tyrant summoned numerous scholars whom he commanded to use all their skill in specious reasoning that thereby Catherine might be led to apostatize. But she emerged from the debate victorious. Several of her adversaries, conquered by her eloquence, declared themselves Christians and were at once put to death. Furious at being baffled, Maximinus had Catherine scourged and then imprisoned. Meanwhile the empress, eager to see so extraordinary a young woman, went with Porphyry, the head of the troops, to visit her in her dungeon, when they in turn yielded to Catherine's exhortations, believed, were baptized, and immediately won the martyr's crown. And so she was sentenced to death, first by the wheel, then, when that failed, by beheading. As she was being led to the place of execution, she looked up to heaven and prayed. 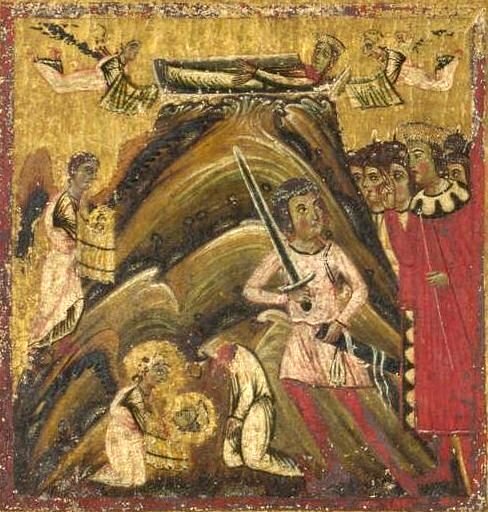 Magarito's scene shows Catherine being beheaded, then her body being carried off to Mount Sinai. 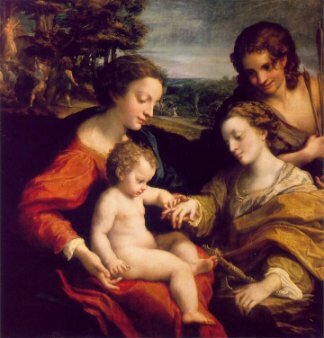 A familiar renaissance image is the Mystic Marriage of St Catherine. This is described earlier on in the Golden Legend and we are reminded of it in the Golden Legend extract above. It is a confusing topic as more that one Catherine can be involved; it is claimed that St Catherine of Siena also had a vision of marriage with Christ. 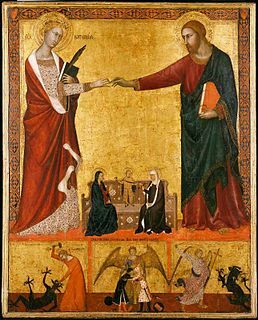 Early images show a marriage with an adult Christ, but in later versions an exchange of rings with Christ as an infant was preferred.